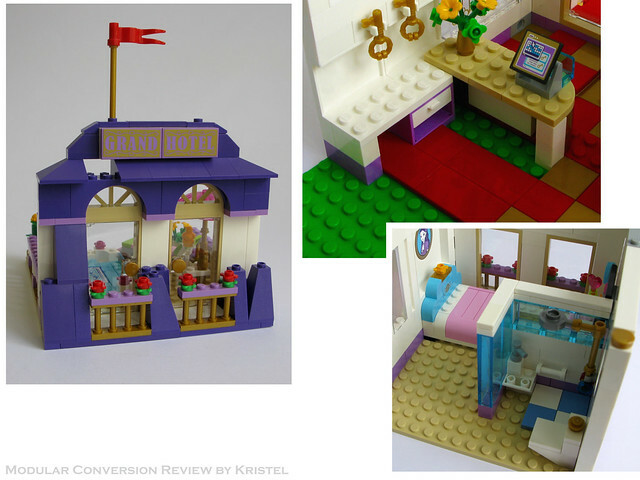 I have previously completed a set review of the Heartlake Grand Hotel (41101) for Friends Bricks, so I won’t repeat that here. 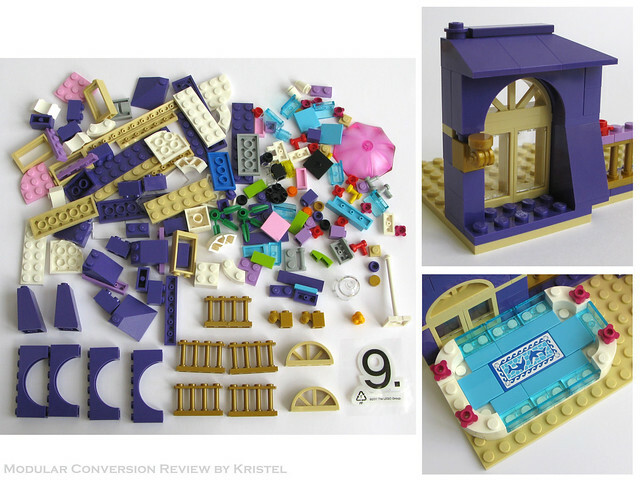 Rather this review will focus on the Heartlake Grand Hotel set as a parts pack and options for modular conversion. 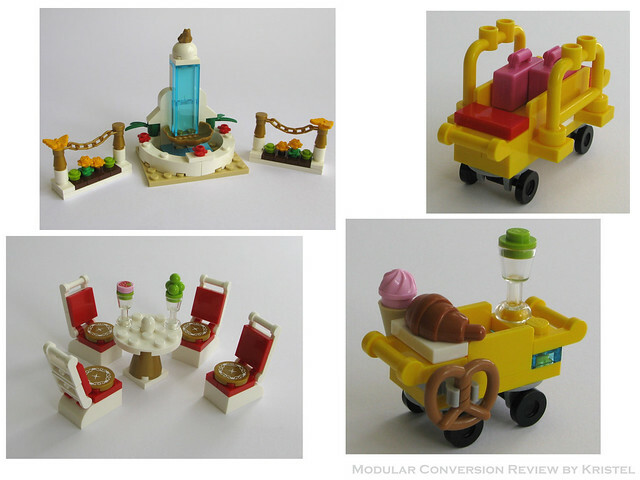 As always, many thanks to the LEGO AFOL Relations & Programs team for providing this set for review! Let’s begin by taking a closer look at the parts. 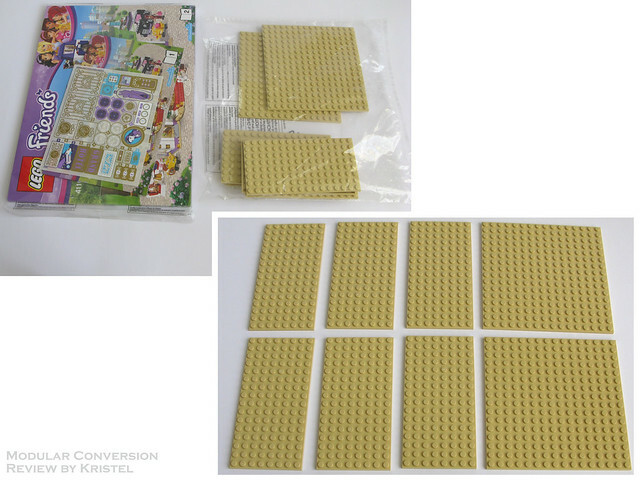 The un-numbered bags include the instructions and a bunch of large Tan plates, which I really appreciate as they are definitely very useful for building floors! The part that immediately caught my eye was the Pearl Gold clam shell. While this part is new for 2015, it is not unique to this set or in this colour. The Pearl Gold frog is new in this colour and unique to this set. The other things that caught my eye were the Pearl Gold chains, the Medium Azure tiles and the Reddish Brown jumper plates with the new style bottoms. Bag 1 doesn’t provide much for building a structure, but does provide some cute accessories. Bag 3 has the first of the new arched windows in Tan, which I’m super excited about and I can’t wait to use this in an MOC! There are also a good number of arches and 1x2x5 groove bricks in White, which are great for adding detail to building facades. 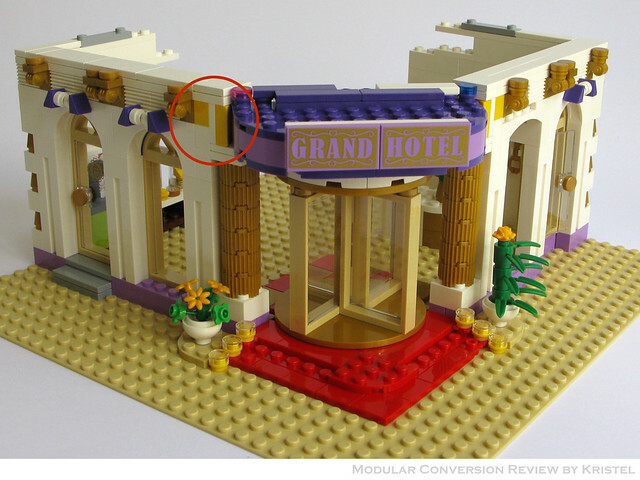 Interestingly, several of the groove bricks are placed with the groove facing towards other bricks in the official build, which seems a waste to me. Bag 4 is almost a repeat of Bag 3, with another new Tan window arch piece, more White arches and more 1x2x5 bricks with groove in White. 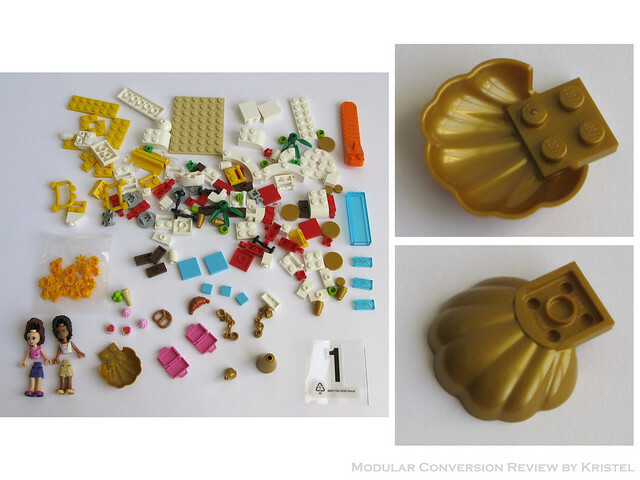 Bag 5 gives us the first of the new 1×1 bricks with scroll thingie in Pearl Gold. I am really excited about this new piece and have already bought a bunch of them in Tan. 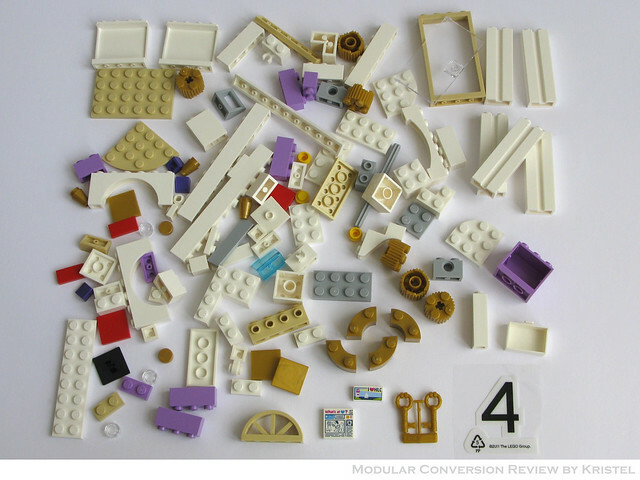 Another thing to note is that there are quite a few longer 1 x X bricks in White, White grill bricks and door frames in Tan, which come in handy for modular buildings (assuming of course that you are building in those colours!). 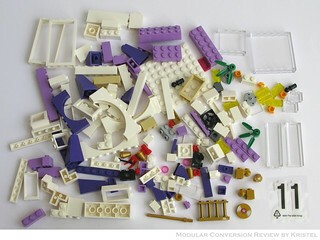 Bag 6 contains a mixed assortment of parts, which are used to build several submodels. I love the design of the piano … very grand! The parts that caught my eye in these two bags are the Pearl Gold columns, which are unique to this set, and the Pearl Gold fences. There are also more White bricks and door frames in Tan and White. Bag 9 is loaded with delicious Dark Purple bricks, plates and roof tiles, with most of them unique to this set. 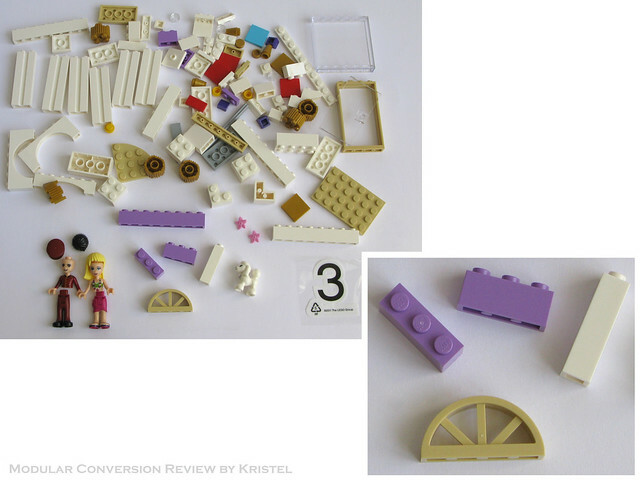 It also includes a couple more of each of the Tan arch window pieces and the Pearl Gold scroll bricks. I love the pool, especially the dolphin feature, and was really surprised how well the Dark Purple went with the Tan. 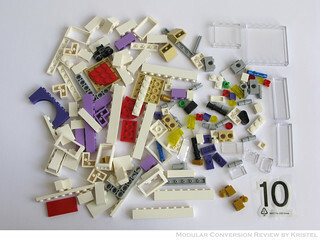 The last two bags contain the pieces for the elevator and are packed with Trans-Clear bricks and panels, arches and White bricks, as well as four more Pearl Gold scroll bricks. 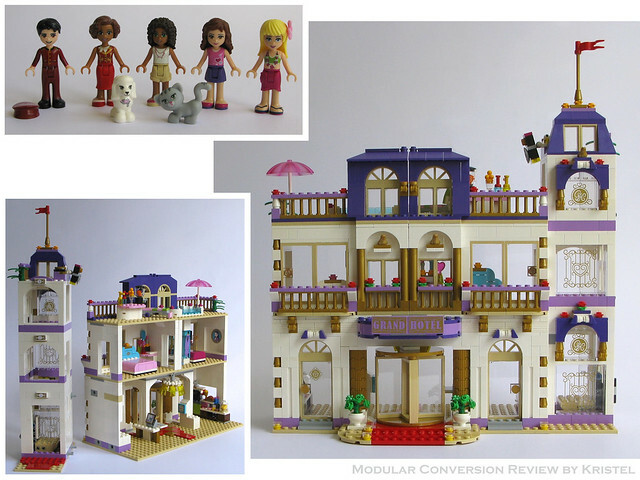 This brings us to the modular conversion part of the review. But first a shot of the official version of the Heartlake Grand Hotel (with its mini-dolls) just to remind ourselves what it looks like. Your first thought may well be ‘Why a modular conversion?”, as this building is most of the way there already, right? Ditch the elevator and make the floors a bit wider and there you have it. That would be too simple. This modular conversion began with me trying to figure out how to make the elevator part of the building as a 32-stud wide modular. I tried all sorts of variations, but just wasn’t able to place the elevator in such a way that I didn’t either lose too much floor space in the building, make access to the rooms difficult or make access to the elevator difficult. So, I scrapped that idea, and accepted that there was a good reason why the LEGO designers put the elevator on the side like they did. Back to the drawing board. 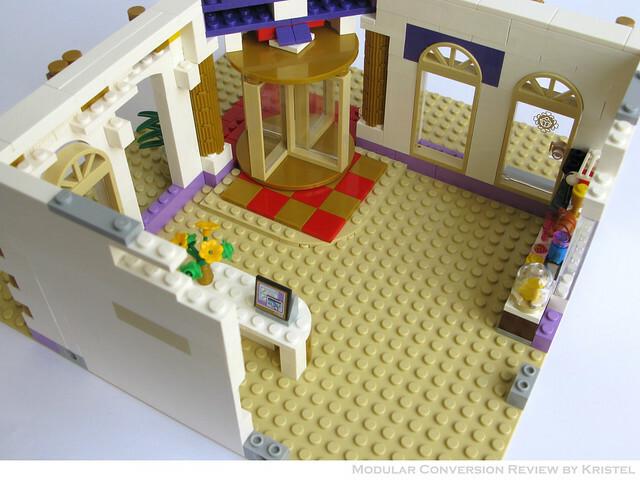 My next thought was that it would be cool to make this as a corner modular, with the revolving door on the corner. And it was … mostly. I was able to convert the revolving door to the corner position with the pieces in the set and just needed a couple of readily available parts to tidy up the gaps at the top of the main entrance. They are in Yellow in the WIP to remind myself what extra pieces I used. You can see that the corner version has plenty of room on the ground floor for the reception, the buffet, seating and the elevator if you put it in the back corner. I really liked the ground floor on this WIP, as well as the start to the first floor. However, I just couldn’t make the corner on the first floor work in a way that I was happy with. I hated to see this half finished and have some ideas for the roof, but am really not sure where to take the first floor. I think I will come back to this at some stage, because I really like the revolving door in the corner. Please let me know if you would like a copy of the *.LDR file to have a go at it yourself. Back to the drawing board again, this time focusing on what I am most comfortable with, i.e. 16-stud wide buildings. 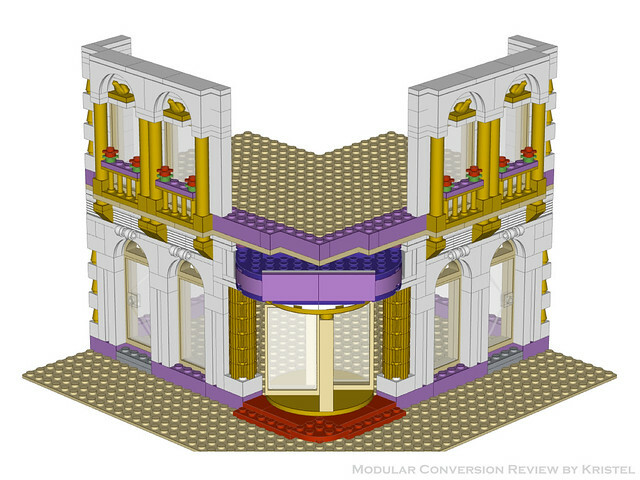 Although it is technically possible to include the revolving door in a 16-stud version I choose to go with the normal door and window option because it allowed me to use those gorgeous new half arch window pieces! It also lined up nicely with the feature windows on the first floor. I got most of the way with the pieces in the set, and just had to find some more Dark Purple bricks and roof tiles, a 2 x 2 corner panel in White for the bathroom basin, Light and Dark Bluish Grey tiles for the front footpath and some Red tiles to finish off the carpet in the lobby. I could have reduced the need for the number of extra Dark Purple parts required if I had made the made the roof lower, similar to how it is in the original model. However, while the roof windows are one of my favourite features on the official building for the way that it shows off the new arch piece, the lack of height in the roof did bug me. 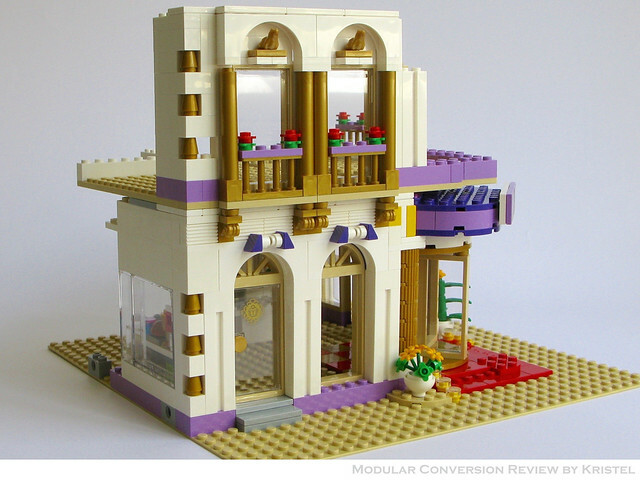 The higher roof I think looks better and also fits in better with my other modified Friends-themed modular buildings. As usual, I have left the back open for playability. I ended up using more windows and Trans-Clear panels and bricks in the side walls than I thought I would need to given the number of White bricks in the set. I have used the back area for a small dining area. However, this area could potentially house the elevator if you were keen to keep this feature. 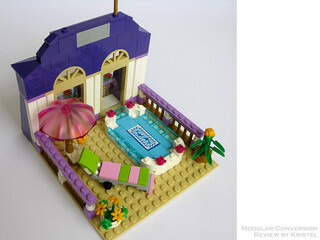 The rooftop pool was one of my favourite details in the official set, so that was always going to stay! I have decided to call it the Boutique Hotel for the obvious reason that, with one room only, it is a very exclusive hotel! 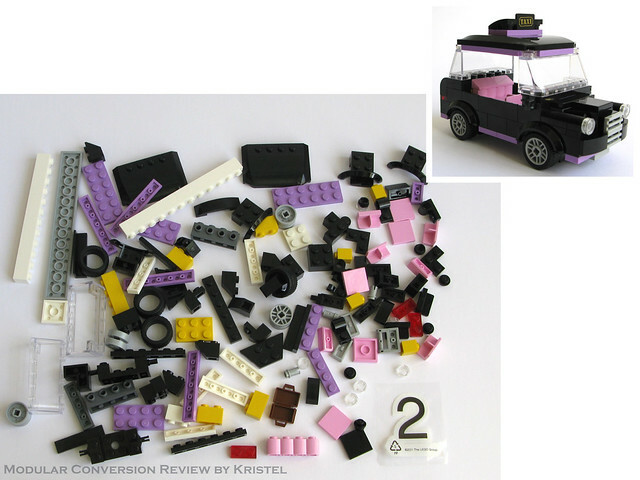 Here are the instructions and the parts list in PDF format. 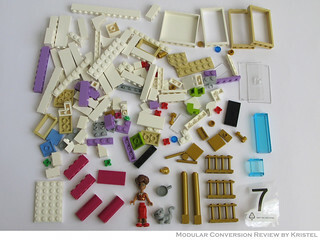 The parts list is also available through Rebrickable. 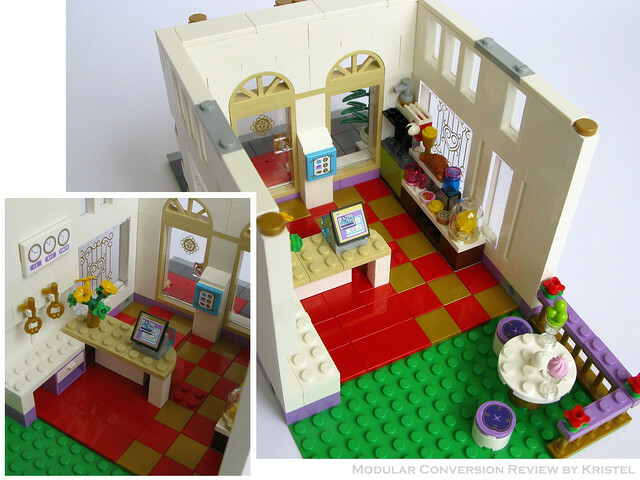 The middle floor is repeatable, so it could easily be a slightly less-boutique Boutique Hotel. 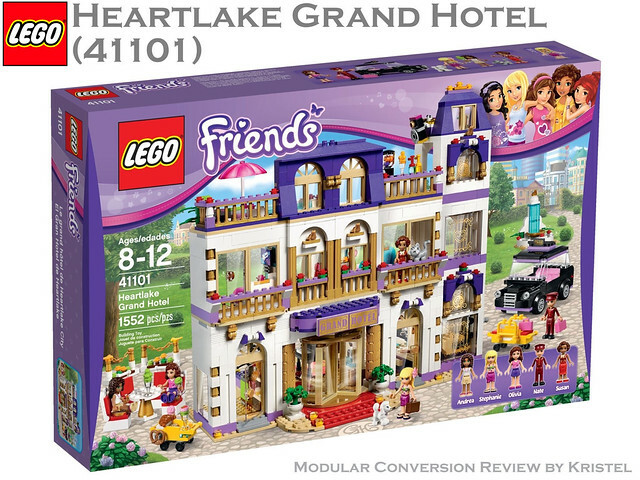 The conversion of the Heartlake Grand Hotel (41101) ended up being a fair bit more challenging than I had anticipated. 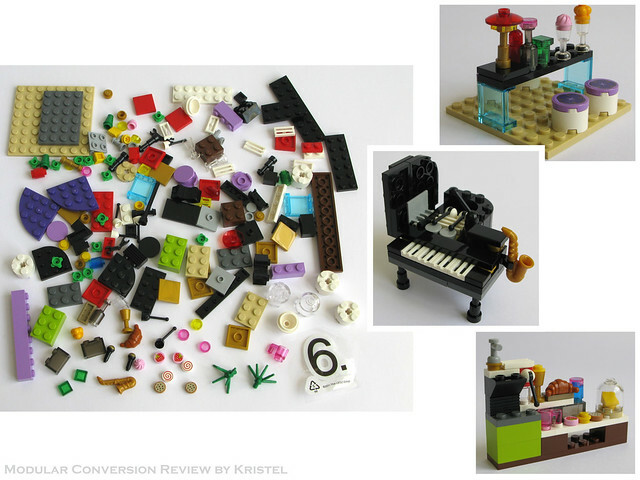 Maybe that was because it started so close to being a modular that I was trying too hard to work with that. Overall verdict? 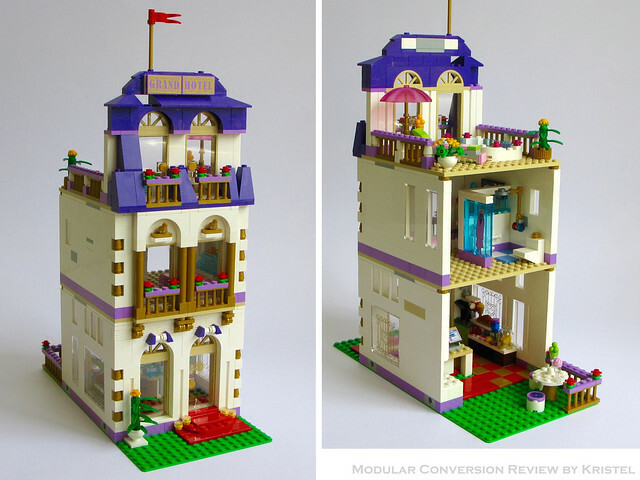 The Heartlake Grand Hotel is not only a beautiful building in its own right, it also makes a great parts pack and is readily convertible into a modular building. 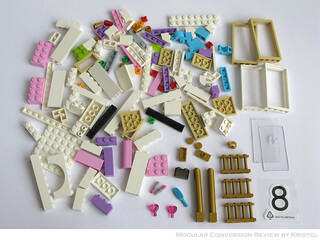 I think the window arch pieces and the little scroll bricks are going to prove very popular, and personally can’t wait to use them in my own MOC. Thanks for reading! And if you do have a go at the corner version, I would love to see it! 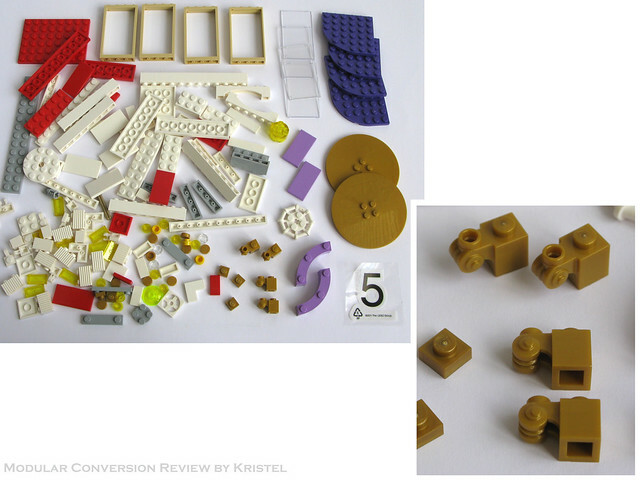 Kristel, I always love how thorough your posts are when you review and re-build sets. I like the detailed pics and discussion, even when you deviate from your original plan. Kudos! 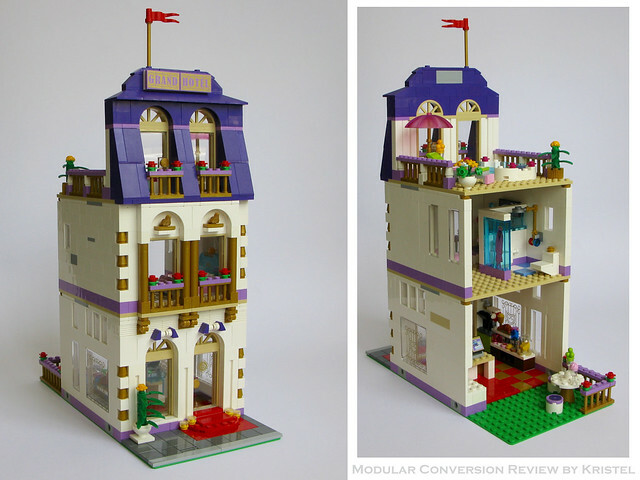 We have two of these Grand Hotel sets in the box and I’ve been pondering how/if we could modularitize them and include them in our street layout. Your post has shared some great ideas about how we can get started! Thanks Jason. I’m looking forward to seeing what you build with your Grand Hotels! This is a wonderful conversion concept. You did a great job with the 32×32 wide version. There are numerous options one could do with the corner bit on the 2nd floor, but it depends on what is to be above it, so that it would integrate well. I am envisioning a balcony portion for eating or relaxing. If there is no 3rd floor, then the roof portion could overhang the balcony to give it a more protected or opened, depending on if people would be enjoy the sun or not. 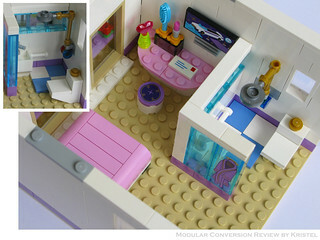 It could be a welcome change from the standard corner modulars. Thanks, Miro! I like the idea of a balcony, and had tried to continue the pearl Gold fences along the corner bit. I abandoned that idea mostly because I needed something to hold the plates at the corner in place. I had imagined the roof would extend to the corner, which would provide a cover the balcony. Well worth “buying for your daughter”!